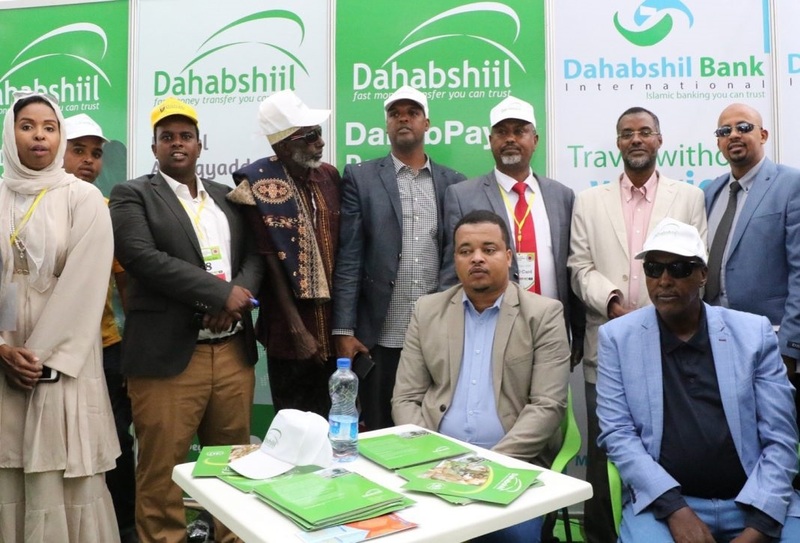 Dahabshiil took everyone by surprise – even loyal subscribers, Sunday, by outshining all on variety, creativity, and presentation of products and services in its portfolio. a number of companies and autonomous bureaus of Dahabshiil Group took part at the 8th Trade Expo of Somaliland opened in Hargeisa on Sunday. Among them were Dahabshiil Pvt Ltd – the Groups money transfer wing, Somtel Telecommunications International, Damal Hotels, eDahab, Dahabshil Bank, MicroDahab, Dahabshiil Motors, and Hyundai. Abdirahman Ali Abdi, Deputy CEO of the Group, speaking at the opening occasion, expressed how delighted Dahabshiil the companies were to participate at the Expo. “Exhibitions serve to introduce potential clients to companies, companies to companies and to act as a launching, entry platforms for new products and services,” he said. Mr. Abdirahman added that the Group was indeed honored not only to attract new, loyal subscribers but to, also, show how appreciative they were of their customers. “Today’s expo is a living testament of how we incorporate client suggestions feedback and suggested improvements to core services and competencies which are the hallmarks of the Group,” he said. Introducing the variegated products to captivated pockets of customers, the marketing team sprang into action as soon as the launching formalities ended. 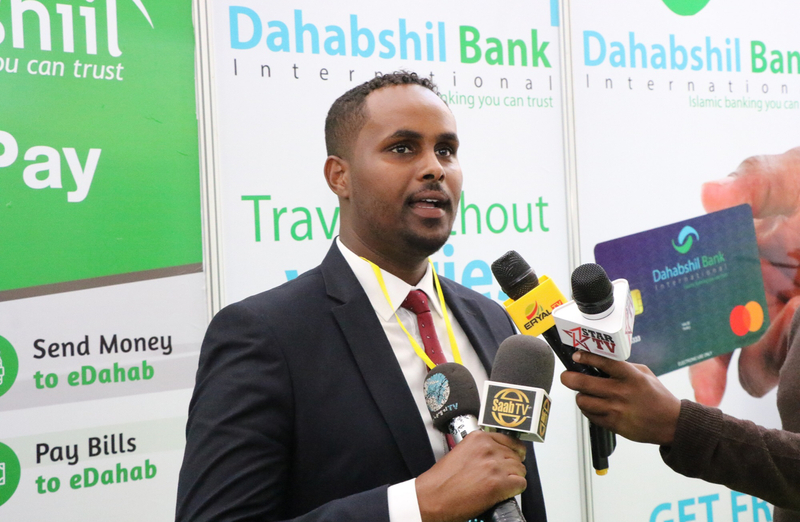 “Dahabshil Bank International would today connect your accounts to eDahab to spare its customers time and effort required to reach tellers and pay points.” Guled Ibrahim Farah. DBI Business Development said, speaking to the media.Guled added that teams were ready at the Expo to open new accounts for new clients, connect accounts to eDahab through the subscribers Somtel GSM number and to provide MasterCards to both personal and business account holders if so they wished. Saad Musa Abdi, Dahabshiil PVT Marketing stated that the Group was introducing DhabPay Portal – a new online service of great potential and a greater number of possibilities. “DahabPay Portal is a dream service for business establishments – no matter how large or small it was. It is a more user-friendly, online version of applications that allowed one to upload beneficiaries, initiate and approve transactions, pay bills, transfer amounts of money, and to inter-connect accounts transferring sums of money as required to and fro between them,” he said. “DahabPay worked well for users equally well on the go or at the office, at a workstation,” he added. Hibo Warsame, Somtel telecommunications Marketing, so delighted university students and, in general, young generations by announcing that one only had to recharge his/her mobile account with only US$2.5 to use it for a whole week on GSM and Internet. Ms also revealed that any new subscriber wishing to install Somtel fas Internet will be given a 25% discount. Somtel has entered into a partnership with Djibouti Telecom on DARE1 to take fast fibre optic Internet to Mogadishu onward to East Africa. TE SubCom will lay the submarine cable. Dahabshiil has become the embodiment of reliability, fast money transfer, and trust not only in Somali-inhabited territories but throughout the world.